The film uses architecture as the director. Two dancers using the floors of a set are working under its tough constraints, but are also left with new breathtaking possibilities of movement. 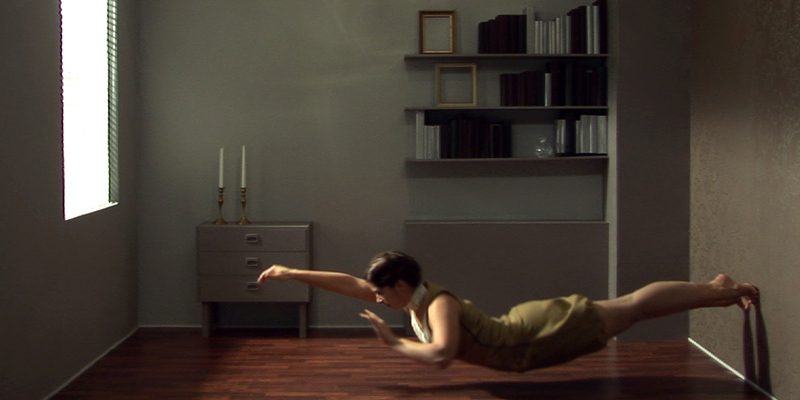 The set in ”Weightless” is split in two, depicting the everyday environments of the living room and the bedroom. Two polarities speaking of public and private, awake and asleep, constraint and release. The film tells a tale of how easily the eye can be deceived and one’s longing to break free from a force that will always keep movements caged, the relentless force of gravity. . This subtle,intelligent film made in 2007 makes a powerful statement on the relationship between our bodies and our modern physical environments. … with an all-female cast, and a sultry female vocal score, it is a visual fusion of the organic (flesh and body) and the inorganic (furniture, fixtures and bedding). A play on the senses, the set is cleverly designed so that what appears to be vertical is actually horizontal. The viewer is baffled by the performers’ seemingly effortless defiance of gravity. Filmed within the confines of four walls that alternately serve as living room and bedroom, everyday items like lamps, blankets and chairs are turned into a magician’s arsenal of props that, combined with skilful editing and brilliant movement, create a masterful illusion. What makes this illusion so compelling is that it is not an illusion at all but only a tilted camera, a carefully lit and designed set, along with divinely inspired movement – nothing short of real magic – that makes this film so special. Dancers Malin Stattin and Tula Lundkvist move with the skill of athletes and the buoyancy of astronauts. A tour de force for the talented Erika Janunger, who plays multiple roles as director, art director, songwriter and lyricist.